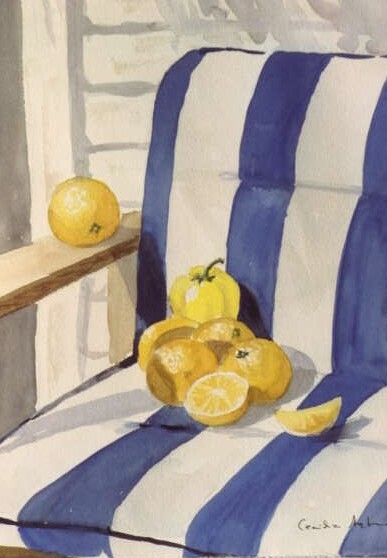 "Oranges" were painted in my garden in Richardson Texas some years ago , I came home with shopping goods and my paper bag tore open and all oranges were on the ground.My boys helped piking them up and put them on a garden chair and voila there was a new painting. In one of my painting groups, our group leader brought all kinds of "stuff" for us to choose from and paint. Well I could just not get into it then but when I went home, I painted 6 of them! Guess I got into the fruits and veggies then but I loved doing the copper with them. This is 1 of the 6! 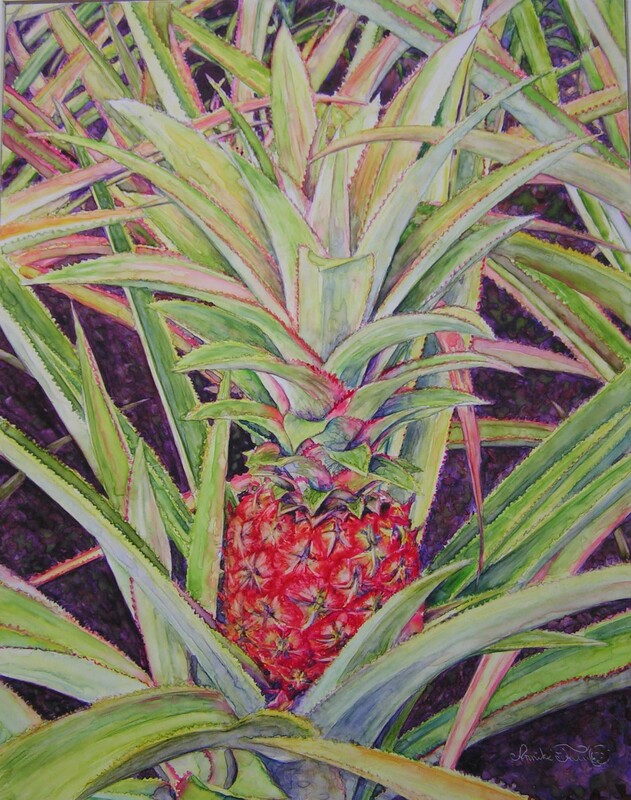 I saw this very red pinapple plant at the Dole farm on Oahu, Hawaii, and knew I just had to paint it. 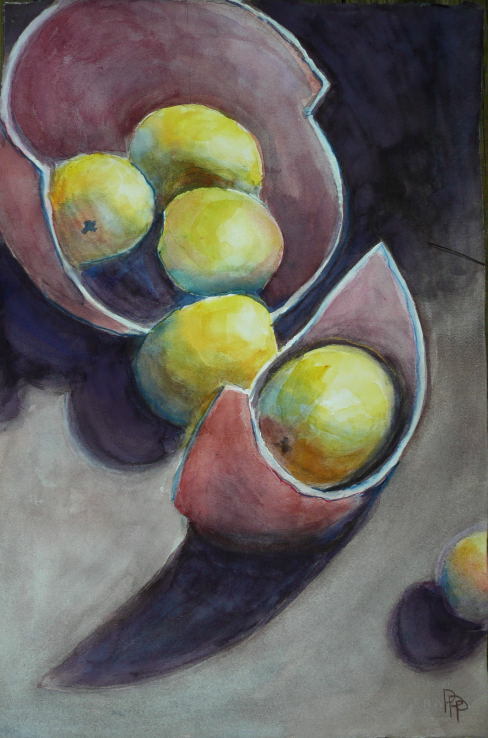 It was painted on clayboard, very slick stuff for watercolor, so a little frustrating, but fun at the same time. 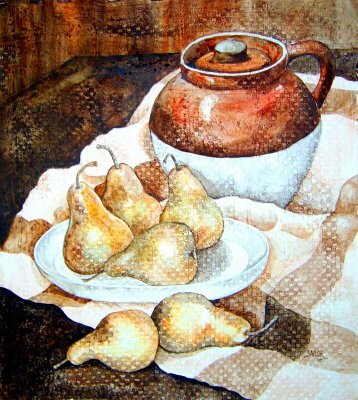 "Bosc Pears and Baked Beans"
This painting began as an experiment after seeing a painting by Myrna Wacknov in an article about her in Watercolor Magazine. 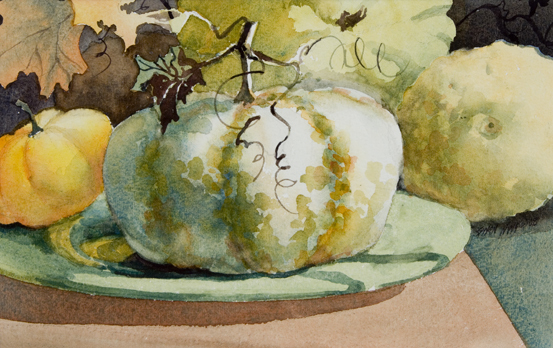 She described a process where she painted on a surface which was gesso stamped with lace. 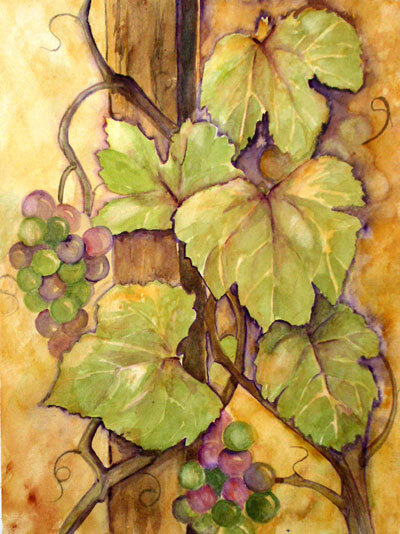 I prepared my painting surface by stamping the wet gesso with pieces of an old curtain given to me by a friend It was fun painting on the gesso, and I was pleased with the results. 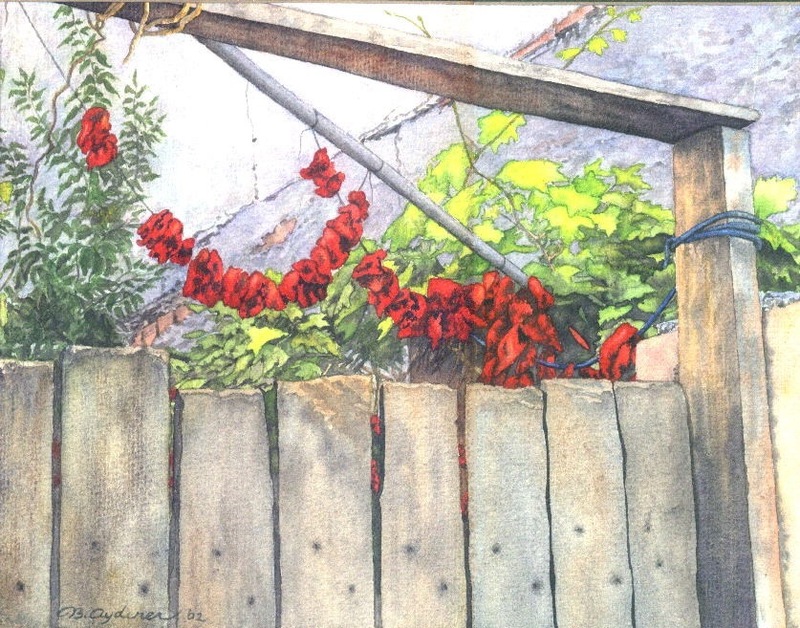 Painted a couple years ago Hillsboro Plein Air Competition, Juror was Robert Gamblin, third place award. We were strolling in the streets of one Anatolian village, and these hot peppers were strung and left to dry in the sun. The hardest part was the black background. 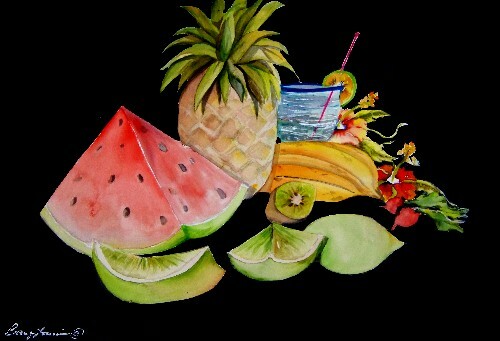 It is what it is.... fruit! 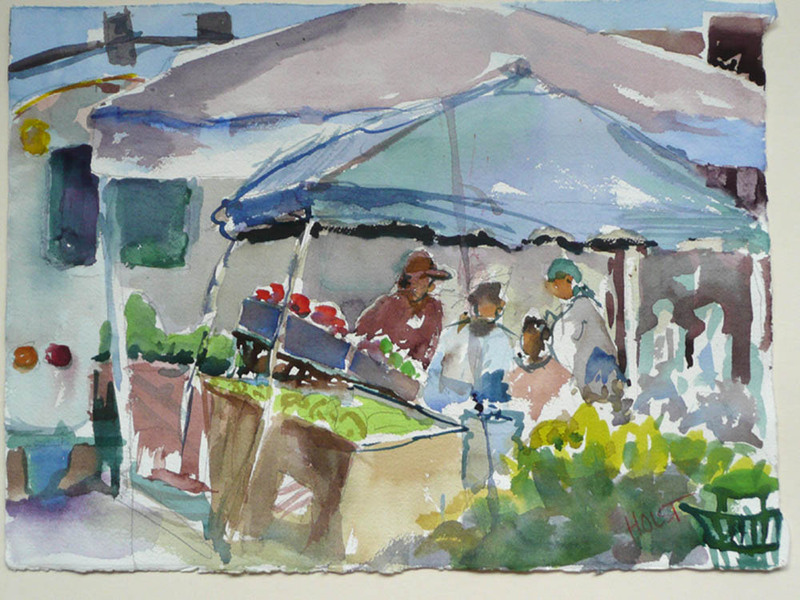 Painted while at an outdoor show. 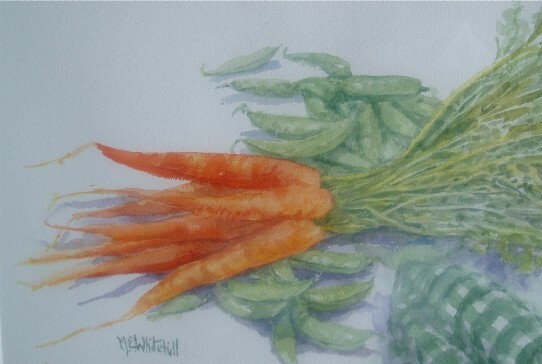 Friends had bought the carrots at Farm Market and left them with me while thay toured the show. 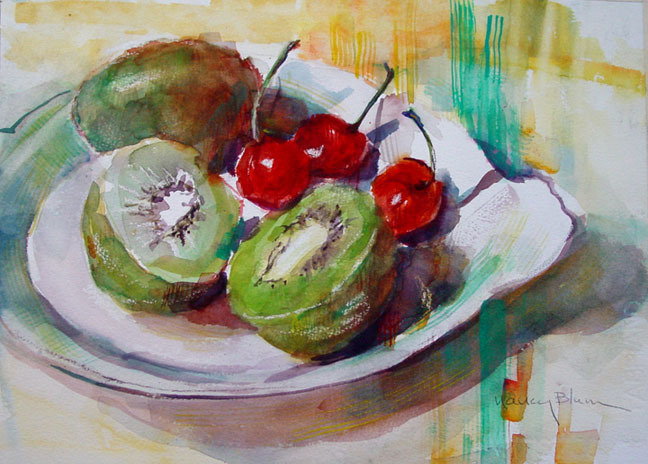 When the theme "Fruit and Vegetables" came up this month, I had nothing already painted but breakfast that morning had me looking at the table with it's dish of fruit - as New Zealanders we love our Kiwi fruit! 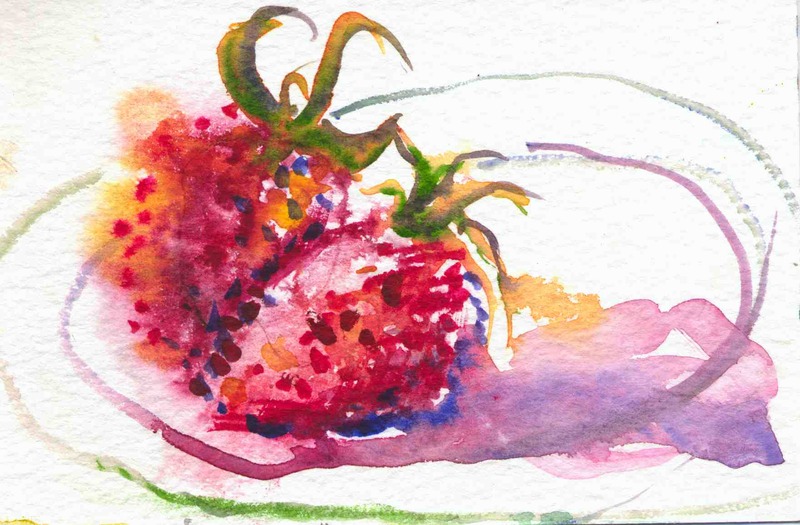 and the tangelos were grown in our garden - so I had to paint what was in front of me - the breakfast fruit bowl! 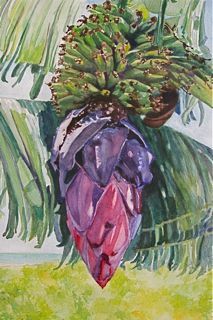 transparent watercolor on Arches 140 lb c.p. 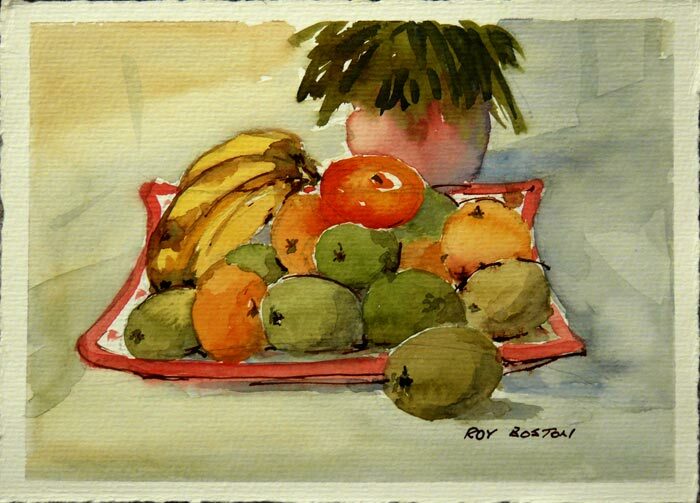 Many fruits have delightful shapes, they offer a wide variety of colors. 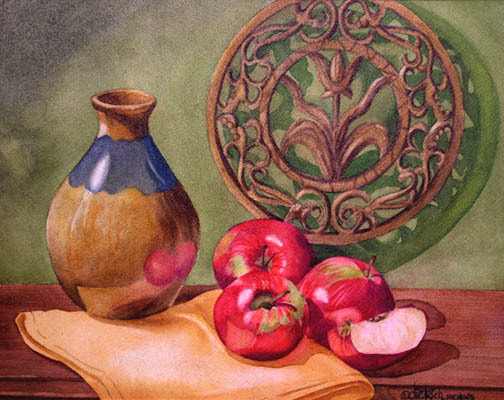 In this painting, I wanted to convey the shine and roundness of the apples and the hand made pottery. The broken bowl and shadows added drama to the painting. 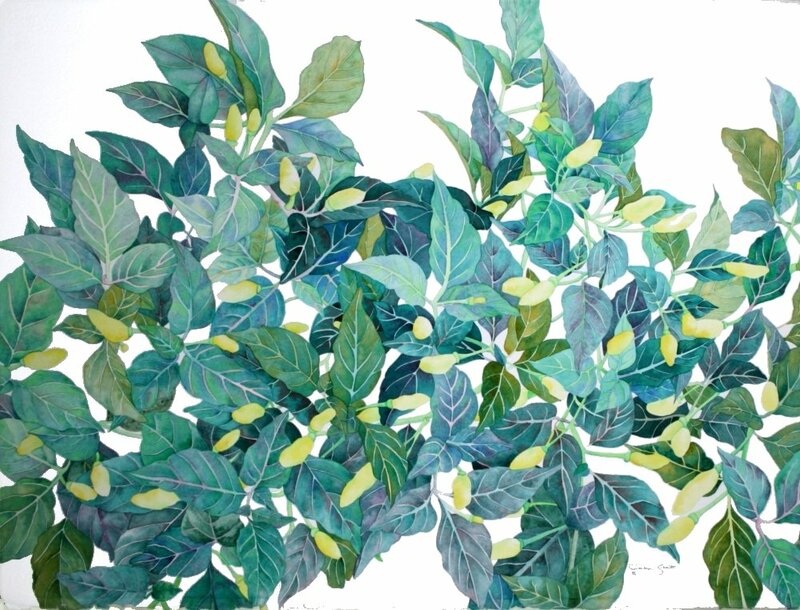 A few years ago I spent some time exploring the organic shapes of a green pepper from various cross sections and with different sketch media. 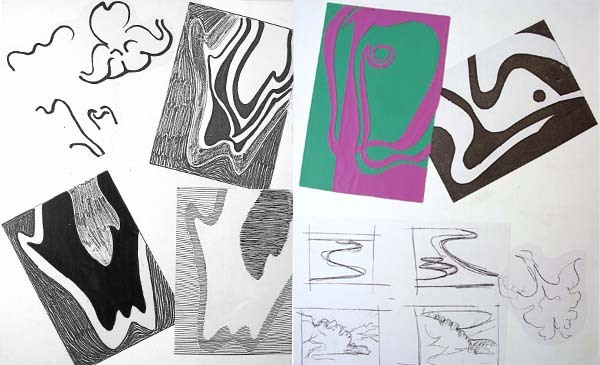 This resulted in a mixed media painting, which I can't find, so here are the sketches. I hope this will give someone an idea to try. From Atlanta, GA but still love kiwis. This painting provided an opportunity to try a new brush. I got somewhat carried away with making stripes with a synthetic striping brush! I wanted to get a painting in before the deadline - had hoped to do a new one but it didn't happen. Love everyone's submissions. My husband Ken's Tabasco pepper plant. Are coconuts fruits? I sure hope so.